Ahead of a major protest in Berlin this Saturday, Leoni Linek reports on Germany’s new refugee protest movement which, in the face of arbitrary arrests and police brutality, has scored a number of successes and inspired similar movements across Europe. When refugee activists staged a sit-in at the Nigerian embassy in Berlin last October, in protest against the country’s complicity in mass deportations, the ambassador hit the panic button and called the police. Two dozen activists were arrested and, as the police later admitted, beaten in custody. I joined a spontaneous rally which gathered and we marched to the police station where the activists were being held. The police attempted to disperse the demonstration several times but we stood our ground, demanding the immediate release of those arrested. When it became clear that we would not obey, an unusual thing happened: the tables turned. Via loudspeakers the police announced they would comply with the rally’s demand and release all activists that same day. As the process was delayed over a period of more than six hours and the arrested were released one by one, with the last dismissal just a few minutes before midnight, we continued protesting outside the police station and celebrated each activist’s return. Most of them were in a state of severe physical exhaustion, some were injured, and one even fainted on a mattress (which had been brought by supporters) – but all of them joined in the chants and songs, overwhelmed by a euphoric sense of victory. Beginning about a year ago, Germany’s new refugee protest movement has had myriad experiences with arbitrary arrests and police brutality. Yet the activists’ determination is unbroken. After a march across the country last autumn, hundreds have been occupying central squares in various German cities, rallying against the brutal treatment faced by refugees in Europe. While the protesters’ demands reflect the long-standing aims of the wider refugee movement, they are pushing them with increasingly militant methods, including squatting and hunger strikes. In Würzburg, refugees even stitched up their lips, an action the city had attempted though ultimately failed to ban (an administrative court ruled in favour of the refugees). Their protest is just one instance in the context of a diverse national movement that can hardly be described in its entirety here. What unites this movement, however, is the relentless activism of its protesters and the fact that they do not ask for charity but, instead, demand – and if necessary take – their rights. Protests first began in January 2012 when Mohammad Rahsepar, an Iranian refugee, committed suicide in a detention camp in Würzburg, Southern Germany. A former policeman in Iran, he had refused orders in his home country and was subsequently imprisoned and tortured. When he fled to Germany in 2011, Rahsepar was optimistic; his sister had been granted political asylum a year earlier and was living in Cologne. Although doctors had attested to his psychologically and physically fragile state and had urgently recommended allowing him to relocate to his sister’s home, Rahsepar was interned in a so-called ‘Gemeinschaftsunterkunft’ (‘communal accommodation’, the German euphemism for ‘detention centre’). After spending seven months in the overcrowded camp, housed together with over 400 other asylum-seekers in former military barracks, Mohammad Rahsepar hanged himself with a bed sheet. Such acts of desperation are not infrequent in detention centres. Just two weeks ago another young man committed suicide in a Bavarian camp. Refugees in Germany are usually forced into isolation in prison-like centres, often in remote locations. While they are awaiting the outcome of their applications, asylum-seekers are subject to various legal requirements, including ‘Residenzpflicht’, or mandatory residence, under which they are banned from leaving the area of the immigration authority in charge of their case. Requests for asylum take months, often years, to be processed. In the meantime, applicants are not permitted to work and are forced to live on paltry benefits: until last year, when the German Constitutional Court ruled that the amount was too little to provide for one’s most basic needs, refugees were thought to deserve even less than minimum unemployment benefits (refugees were receiving approximately 220 euros, the unemployed are paid roughly 340 euros). Benefits are often doled out in the form of vouchers, to be used within the camp and spent only on certain permitted goods, isolating refugees even more from the towns in which they live and depriving them of their most basic right to self-determination. In addition, the refugees are often silenced by language barriers, without sufficient German courses available. The few on offer are rarely free of charge or within reach, which makes it difficult for asylum-seekers under ‘Residenzpflicht’ to attend. This shows the height of hypocrisy of Germany’s racist asylum policy, which insists that “refugees should learn German” yet forces them to break the law and spend their last penny in order to do so. The reactions to Rahsepar’s death, however, speak of courage, not despair. Fellow refugees in Würzburg, finding themselves in the same situation as Rahsepar, started refusing their food packages and vouchers and began demonstrating in town, demanding a halt to deportations, the abolition of mandatory residence requirements and the closure of detention camps. They set up a temporary protest camp and went on hunger strike, after talks with politicians had failed to materialise. 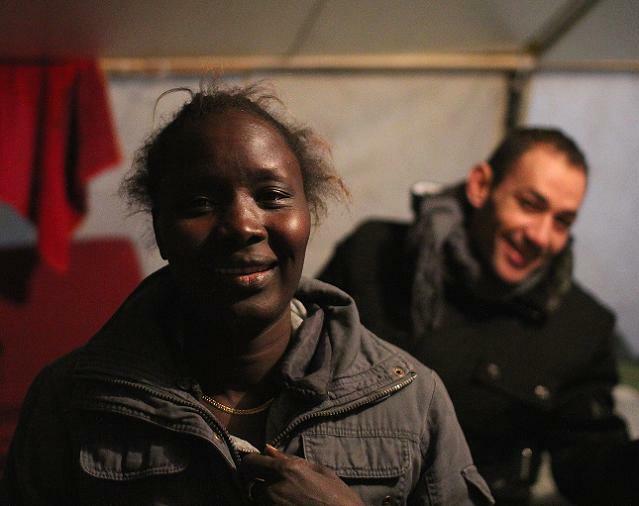 When asylum-seekers from the surrounding towns were unable to take part in protests in Würzburg – due to their mandatory residence –, they built their own protest camps, under the common name “Refugee Tent Action”. To date, there have been protest camps in nine German cities, and the movement is growing, with new camps sprouting across Europe, for example, in Amsterdam and Vienna. In order to mobilise supporters and refugees across Germany, the protesters set out on a nationwide march last autumn. On September 8, 2012 about 70 refugees from various countries embarked on an almost 600-km foot march from Bavaria to Berlin. Accompanied by a group travelling by bus, the caravan held demonstrations in a number of cities throughout the country. When they reached the capital city in early October, the protesters were welcomed by a solidarity march numbering over 6,000 demonstrators. Banners read “refugees welcome”, “no human being is illegal”, and “right of residence everywhere”. Right now yet another Refugees’ Revolution Bus Tour is taking place: About a month ago, refugee protesters embarked on their second trip, visiting 22 cities and travelling a total of 3,000 kilometres. A large demonstration in Berlin, scheduled for this Saturday, March 23, will celebrate their return and mark the movement’s anniversary. Since last year’s march the refugee protesters have set up camp in Oranienplatz in Kreuzberg, one of Berlin’s most popular boroughs, home to an eclectic cultural scene and a large immigrant community. Many neighbours, though initially sceptical, have come to support the refugees’ presence in the square and try to help out however they can, e.g. by donating food, clothes or furniture. The various tents now house a kitchen, an assembly space and several bedrooms; it has become a home for some of the protesters. There is also an information point, usually staffed by volunteer supporters, who also help with cooking or spending night shifts guarding those who are asleep. For the time being, the police do not have any plans of evicting the tents. The protesters have not contented themselves with the seemingly peaceful atmosphere of the camp. In October 2012, having being ignored by politicians, some of the activists decided to go on hunger strike at the Brandenburg Gate to call attention to their struggle and put pressure on the government. When they met with Maria Böhmer, the German commissioner for migration, integration and refugees, she promised to organise talks with members of parliament. In response, the refugees called an end to their hunger strike. However, when no action was taken by Böhmer and the government, in response to an inquiry, announced that it no longer felt any need to meet the activists, the hunger strike was restarted. Although their protest under Berlin’s signature attraction regularly sparked tourist curiosity, it was equally often met with violence by the police, who repeatedly confiscated tents, mats and sleeping bags, and eventually evicted the temporary camp. The activists returned to Oranienplatz, but when temperatures dropped sharply in early December, some of them sought shelter at a school in Kreuzberg. “To be given the place is not in our interest. We wanted to show that we can take something ourselves”, says Napuli Langa, an activist from South Sudan, encapsulating the movement’s credo: that the task of the oppressed is not to prove themselves worthy to their politicians, but to demand and, if necessary, take what they are entitled to. The school has been squatted ever since and serves as a retreat for the ill and those with families. Many spend the night there and return to the main site every morning. Nonetheless, the camp at Oranienplatz remains the central location of the movement: “This is our battleground,” says Langa, “we’re staying here until our demands are met”. Not an easy task, especially since most refugees are breaking the law simply by being there. They are violating mandatory residence rules, often endangering their asylum appeals. In addition, the activists regularly face racist treatment by the German authorities and suffer brutality at the hands of the police. Ten days ago, for example, the police attacked activists of the Refugees’ Bus Tour in a detention centre in Cologne, where they were distributing flyers, and detained 19 of them. They were held in solitary cells without food or medical treatment – one of the protesters had been unconscious and was injured when arrested – for twelve hours. And this is just the latest incident in a long series of arrests and attacks. Nevertheless, the movement continues to push for its demands: a halt to all deportations, the abolition of mandatory residence (‘Residenzpflicht’) and the closure of all detention centres, which the activists have been calling ‘Lager’ (camp), angering many politicians who believe the term is too closely associated with ‘Konzentrationslager’, the German word for concentration camp. “They urged us not to say ‘Lager’”, Napuli Langa reports after a visit to the German parliament, “it reminds them of their own history which they don’t want to repeat”. The protesters also demand the recognition of all asylum seekers as political refugees, arguing that all reasons compelling someone to flee their country, including socio-economic ones, are ultimately political. 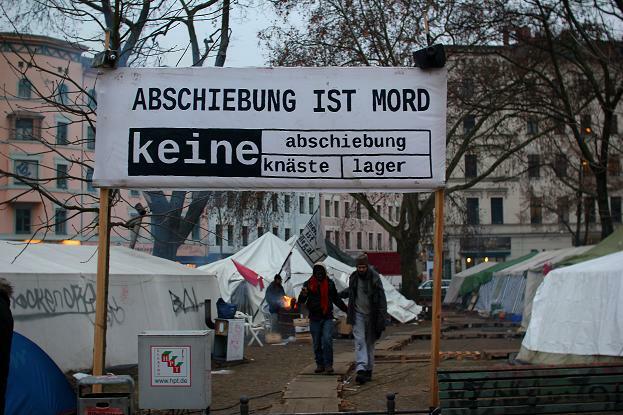 Unlike many earlier refugee protests in Germany, the activists frame their demands in a postcolonial context: ‘Our countries’ poverty is due to your countries’ exploitation’, is a message often heard at the movement’s protests. These demands are far from being met but some limited successes have already been won at the local level. ‘Residenzpflicht’, which requires asylum seekers to stay within a narrow belt around the authority in charge, is not subject to federal jurisdiction, and last December, Hessen became the first state to overturn the law. Similar things could happen in Thuringia, where all parties except the Christian Democrats support its abolition. But the movement’s greatest achievement to date consists in breaking isolation and creating empowerment on the side of the refugees, while generating widespread debate and support among non-refugees. In addition, the movement has served as inspiration to others and has begun spreading across Europe. Last year, a group of activists set up a migrant protest camp in Amsterdam, which was evicted in December, while similar protests have been taking place in Belgium. A lively movement with a Refugee Protest Camp at its core has also sprouted in Austria, where activists squatted the Votive Church in central Vienna for several months, before they recently had to relocate to a monastery. The movement there has employed similar methods to its German counterpart – including hunger strikes, marches and occupations – and close ties exist between the two. The emergence of these new struggles across Europe brings hopes that a transnational refugee movement with real political power is in sight. One more reason to take to the streets in Berlin this Saturday. it is great to read such a profound article, which proofes well investigantions on the history of the movement. There is only one fact incorrect . You are writing : ” Today, there are protest camps in nine German cities, and the movement is growing, ” (sic) I have to admit that this is not true. The protestcamps were all closing sooner or later, because after the tent action the next step was the “break residenzpflich” march footmarch and bustour which arrived in berlin on October 04th. Thank you for your comments, Elsa. I was in fact not aware that most of the camp sites in other German cities are no longer active – the info is much appreciated (and the sentence has been amended). I was waiting to hear what is racist about deporting asylum seekers. After reading several paragraphs, I’m still none the wiser. Thanks for writing this, it’s great! @Edmund Blummin Burke: try reading the whole article then! Or would you rather waste the author’s time by having her retype it all, word for word, in the comment box?